If I'm not walking in to pick up my loyal routine of Ultrabland & Ocean Salt (non self preserving version, mind!) it's all about the bath bombs & melts. Left typically for the weekend to ultimately soak it up. I picked up Star Light, Star Bright, last month - let me tell you something. Unless you're prepared to still be seeing glitter for weeks to come, don't bother. There was no escaping it. Face, hair, in the bush brows, ruined pedicure and then it got on the furniture and the toilet seat, obviously I didn't bath towel wax it off and yes...it's stubborn as hell to remove. As pretty as all that glitter is, I wasn't a fool to make that mistake twice. Mmmelting Marshmallow Moment this one my nan picked up for herself, whenever I go to LUSH I always ask her to pick something for herself. 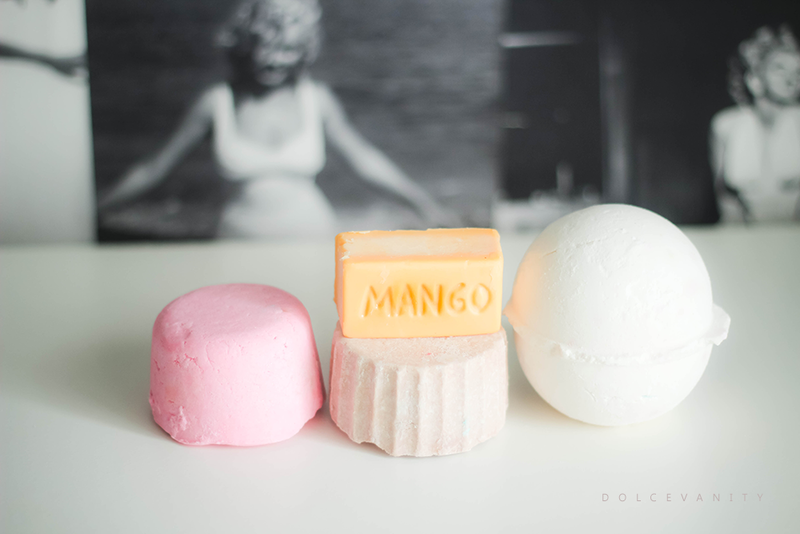 She picked up her felt bath melt, good for young, delicate or irritated skin. This has marshmallow powder, Fair Trade Colombian Cocoa Butter, Almond Oil & Chamomile Powder as the active ingredients. Smells just as good as marshmallows! You've Been Mangoed a fast melter in the hand. Smells heavenly, mango scents are one of my top 5 scents for things. Really hydrates & moisturises the skin when it's melted into the water. Key ingredients Fair Trade Colombian Cocoa Butter, Mango Butter, Lemon Oil, Lime Oil & Avocado Butter. It's small but it certainly works. Dragon's Egg is an all time favourite of mine along with So White but I picked up Dragon's egg this time around, you can see how I feel about it right here.